Great photo, and I have been trying to work out the date. The earliest photograph I can find is by Francis Frith, taken in 1890, which shows quite a bit mor cliff before the sea. The road was then the cliff side of the Station and not behind it. I suspect this could have been taken 1910ish or later? My Great Grandfather George Thomas Sweetingham was a Coastguard here 1879-1876, then moving on to Freshwater and Atherfield, IOW as Chief Coastguard. Oops ... I meant my Grandfather served there 1870 -1876. Apolgies for the crytographic error ...!! I will get it right it this time ..!! My Great Grandfather was a Coastguard there betwee 1870-1876. 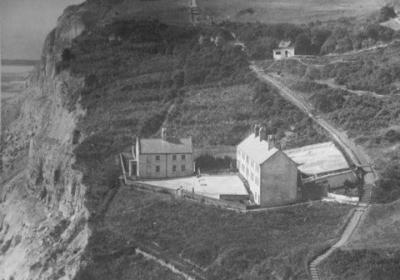 Just for further information, prior to the Station being here on the cliffs, it stood on the beach east of the Ecclesbourne stream. They were wooden houses that had been insecure for a long time and were substantially damaged by storms in 1859 as to make them uninhabitable.